Cricket, by Kane Williamson is an old-fashioned How to book; albeit a richly coloured one. Like you would expect from Kane Williamson the short chapters are laid out methodically. There are four main categories; Batting, Bowling, Fielding and Captaincy followed by a miscellaneous section that even includes the rules of backyard and beach cricket. Under those categories he carefully goes through the finer points. For example in batting there is Elbow to the Sky, Balance, Using your feet, Soft hands (of course), Playing late, timing etc.. There is even a comparatively large section on Unconventional or risky shots where he weighs up the riskiness of shots like the scoop and the ramp, and almost makes them sound so pure. He even touches on his ban for chucking. It is a good book that should sit in the bookcase or kit bag of any aspiring cricketer. Its content is broad, yet it doesn’t get lost in needless detail. 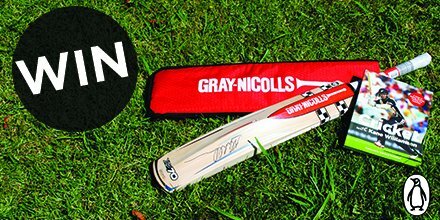 In conjunction with Penguin Books NZ, be in to win 2 prize packs each containing a signed Gray Nicolls bat and a copy of the Kane Williamson Cricket book. In the comments below enter your prediction of how many runs will be scored by New Zealand in the ODI v Bangladesh at Hagley Oval on Saturday, 16 February. 317 … I hope I’m right; I’d LOVE this bat! Gonna gamble and say we’re chasing a low target.